For chronic over-planners like myself, the day after Halloween means only one thing: an overflowing plastic cauldron full of way too many fun-sized candy bars. This, of course, leads to me aggressively pushing candy on everyone I come in contact with in a desperate attempt to get rid of the extra candy before my willpower fails and I end up with the kind of stomach ache that can only result from eating excessive amounts of Halloween candy and the guilt that comes along with it. This year, in an effort to break this pattern, I’ve made a healthier version of one of my favorite candies so I can satisfy my candy craving without digging into the chocolate cauldron too many times. Reese’s Peanut Butter Cups were the first thing that came to mind when I pondered on which candy would be fairly easy to revamp. After all, at first glance chocolate covered peanut butter patties don’t really sound all that bad for you. It’s really the addition of tons of sugar and who-knows-what-else that puts them solidly in the junk food category. By taking them back-to-basics I’ve turned the Reese’s cup into a whole foods, nutritious treat with heart-healthy flax meal, protein-packed peanut butter, and antioxidant-rich dark chocolate. This is a snack that will satisfy your sweet tooth and hopefully keep you out of the kids’ trick-or-treat bags! The most important thing to remember when melting chocolate is patience. Heating the chocolate too much will cause it to seize up on you and you’ll be left with an unusable mess. Heating the chocolate in the microwave for short intervals (10-20 seconds) and stirring in between is the fastest way to go, but using a double boiler is a little safer as it really forces you to take your time. You’ll have some leftover chocolate after doing the dipping, but I find this to be an excellent excuse to make hot chocolate! Also, feel free to use other flours or ground nuts or seeds instead of the flax meal. You’ll likely need to adjust the quantity, but just start with a little less than 1/4 cup and add until you reach the right consistency. Stir the peanut butter and maple syrup together in a bowl until well combined. Stir in the flax meal a little at a time until the mixture has the consistency of a soft cookie dough. 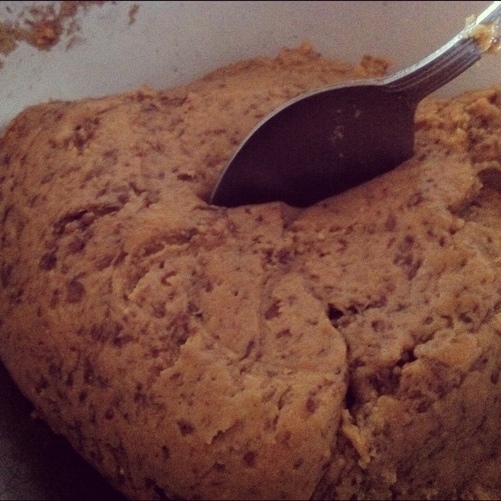 Add more flax meal if the dough is still too sticky until you reach this consistency. 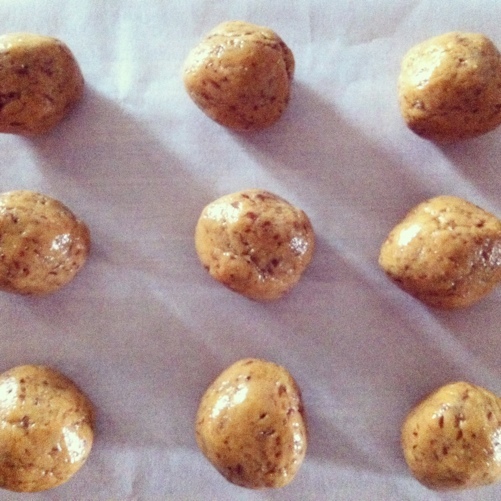 Scoop a rounded teaspoonful of the dough and roll into a ball. Set aside on a tray or baking sheet lined with parchment or waxed paper and repeat with the remaining dough. Melt the chocolate on the stovetop in a double boiler or in a glass measuring cup in the microwave. Stir in the cooking oil to thin a bit, if desired. Using a fork, dip each of the peanut butter balls into the chocolate, coating completely, then let the excess chocolate drain off of the ball. Return the chocolate coated ball to the parchment lined tray to harden. 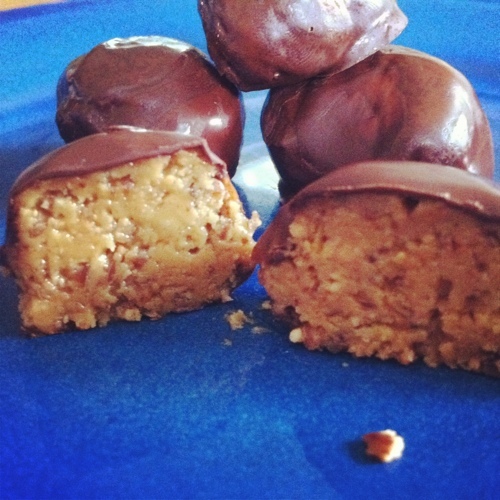 Once the chocolate has hardened, store the peanut butter balls in the refrigerator in a tightly closed container. If you need to stack the peanut butter balls on top of one another, put sheets of parchment or waxed paper between the layers. I love that you used dark chocolate (its my fave!). These look absolutely wonderful, I wish I could try one!! Thanks, Kristi! I’m a big fan of dark chocolate, too. As far as I’m concerned, it’s the only chocolate! Oh I NEED some of these in my mouth RIGHT MEOW!! I love those Reese’s cups and love that you have given them a healthy makeover. Can’t wait to try them!